This is College Physics Answers with Shaun Dyhcko. 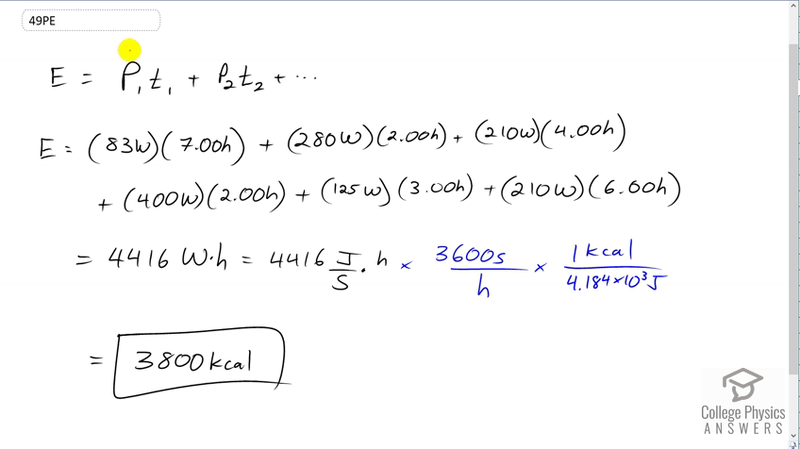 We're going to calculate the total food calories that the student burns in a day and we're going to multiply by the power consumption of each activity multiplied by the time that they spend doing that activity, and then adding all those pairs of power times time terms together. So we have sleeping for seven hours, so that's 83 watts of power consumed during sleeping times seven hours. As a shortcut, I'm not converting the hours into seconds yet. So I'm just going to leave them as watt hours because otherwise I'd have to multiply by 3600 seconds per hour in each of these terms and that would just be annoying to write that down so many times. So I'm going to keep my units as watt hours and then deal with the conversion in this last step here which I'll explain in a second. So we have 83 watts during sleeping multiplied by seven hours, plus 280 watts while walking to school multiplied by two hours, plus the 210 watts while attending class multiplied by four hours in class, plus the 400 watts while cycling times two hours, and then plus 125 watts while sitting relaxed for three hours. Then add to that 210 watts consumed during the six hours of studying. This works out to 4416 watt hours. Now a watt is a joule per second and then we're multiplying that by hours. In order to make these units properly cancel we have to do a conversion. So, we multiply by 3600 seconds per hour and so the hours cancel and the seconds also cancel and we expected these time units to disappear because we're multiplying watts by time and so that works out to energy, so we expect to have joules left over there. Then we want to convert those joules into kilocalories so we multiply by one kilocalorie for every 4.184 times ten to the three joules giving us 3800 kilocalories consumed by the student in a day.